Magdalen College School enjoyed an excellent day at the ECF Junior Team Challenge Finals at Hertford College on April 23rd. Twelve strong teams who had qualifed through different zonal tournaments competed for the championship title over five rounds. MCS finished as runners-up, only ½ point behind winners Kings College Wimbledon (with whom they drew 2-2 in the head-to-head). MCS also finished 1st= (with Newcastle Grammar School)in the team chess problem solving competition held at the same time. As some of you will be aware at the last OCA AGM it was decided that an annual best game award be instituted in Ray Starkie's memory. This will be judged by Matt Rose. Games should be submitted Wed 16 May - so if you have played any games which you are particularly proud of this season in OCA events (the League, The Frank Wood Shield and the Chiltern League) get them in! Submit your game by emailing it to Roger Thetford, the League Secretary (email address on the Contacts page), in PGN format - Please, please, please, no photos of scoresheets! If you are unsure of what PGN format is please visit PGN editor where there is a nice on-line utility that will help you create a PGN file. Click on the "2.Game moves" tab where you can play out your game, then click on "NEXT" to add the details about the players, and "NEXT" again and the PGN file is in the window. Simply cut and paste this into your email to Roger or (probably better) save it into a file and send it as an attachment. Hopefully this will help members give more informed feedback at the consultation web site https://britchess.wufoo.com/forms/ecf-monthly-grading-consultation which I'd like to remind you is open until 15th March. Here is a belated report on the Bucks v Oxon U150 game held on the 16th February. It was one of the closest matches I can recall. Unfortunately we started a board short which didn't help things, but the match was very level with the lead switching from one side to the other. I had a fairly quick game and managed to recover from a minus position to a level one with a blocked position. I couldn't see a way through and so accepted the offer of a draw. This left me free to watch the remaining games. And what a roller coaster ride it was. When we got down to the last 3 boards Oxford were 1 point in the lead. A draw kept us in that position and the last 2 games looked fairly drawish. However, it was not be. The penultimate board fell to a knight fork, which left the score equal. The last game to finish looked level, but we were very low on time and eventually ran out of time. So a rather unlucky 1 point loss. This puts Bucks in the lead with 8 points and Oxford on 6 with one game to play. The last match of the season is on the 16th March away at Hants, so if you haven't already contacted me and would like to play, let me know. Witney's Marcus Harvey had already finished first equal (with David Zakarian) in the Open section at the November Witney Congress, which formed the first leg of the Oxfordshire Individual Chess Championship for 2018-19. With outright victory at Kidlington, where David was not playing, he clinched his first Oxfordshire Individual title with two rounds of the second leg to spare, amassing a total of 8.5 points out of 10. Phil Hayward (Oxford City), who shared the U190 grading prize at Kidlington, finished in second place in the Oxfordshire Championship with a total of 5/10. Use current (January) ECF A-E grades. If a player does not have an A-E grade, obtain an estimate from the Grader, Peter Hemmings. Please give Peter two weeks' notice. Do not round the average handicaps before calculating the difference. Oxfordshire started the year with an impressive win over Berkshire. We were playing on 19 boards at Berks request and generally outgraded our opponents especially on the bottom boards. The top 10 boards scored 5:5 with Berks, but the bottom 9 scored 8:1  an impressive margin. Thanks to all who played, I hope you had an enjoyable afternoon's chess. Thanks as usual to Simon for collecting the equipment, setting up and putting away. The win puts back at the top of the table, at least for now. The result of the Bucks v Hants match has yet to appear on the website. Our next match is away to Bucks on the 16th February. I have had a good response to my request for players, with 13 people who are willing to play so far, so if you would like to play please email me (stephen.rumsby@maidford.plus.com). number at last year's event, with 66 entrants. separated on the tie-break by their sum of progressive scores. details of the draw can be found on the OCA website. or helped clear up at the end of the evening. The Oxford County U150 side crashed to their first defeat of the season against a stronger Hants side. Although we marginally outgraded them on the top 7 boards they outgraded us on the rest. So we knew it was going to be a tough match, and so it proved. Their average grade was 129 to our 119. By the half way stage it was roughly equal but then they crept ahead and eventually won 8.5:11.5, and this despite them defaulting on 2 boards. Congratulations to those who won or drew and commiserations to those like me who lost. Thanks to everyone who played, and to Simon for his help. Our next match is on the 19th January at home to Berkshire, then we have 2 away matches on 16th February against Bucks and 16th March against Hants. Despite the loss we are still level with Bucks at the top of the table. A privacy statement for the Oxfordshire Chess Association is now published on the Admin Documents page, and is also available at the link below. This builds on the very helpful clubs template provided by the ECF. Thank you to all the team captains for submitting their lists of starred players by today's deadline. The list is linked below. Rule 2.3 in the updated league rules applies. Captains from clubs that have more than one team in a division (currently Cowley, Didcot and Witney) may wish to note a subtlety in Rule 2.4, "Playing for more than one team". Non-starred players who are graded 125 or lower at the start of the season are permitted to play without restriction. Players graded 150 or lower may play in Division 1 without affecting eligibility to play in lower divisions, but once they have played four games for one division 1 team they may no longer play across for any other division 1 team. Similar restrictions on playing across apply to anyone graded over 125, regardless of division. Well, it couldn't have got any closer. Bucks requested to play only 19 boards as one of their players was unwell. The two teams were fairly evenly matched in terms of grading, so it looked as though it would be a close call. And so it proved. Unfortunately, I was so preoccupied with my game that I didn't see much of any of the others. I was the second to last to finish by which time we were level on 8.5 points each. I had blundered a rook and thought about resigning, but decided to play on and see if I could swindle something. I managed to fork his queen and rook with my knight, which left me a knight down. Then, just as he was about to crash through I managed to get a perpetual, so we were still level on 9 apiece. This left Alexy Pegushev to decide the match and fortunately he won. So another win for Oxford 10-9, which puts us at the top of the table. Thanks to everyone who played, I hope you all had a good game even if you didn't win. Thanks to Ray for stepping down at the last moment and to Simon for getting the equipment and refreshments. The OCA AGM on Thursday 13 September updated some of the League Rules. (i) The former Rules 2.3 and 2.4 on 'starring' players were combined into Rule 2.3, with the main addition being a deadline by which teams required to 'star' four players are to notify the Secretary (now Roger Thetford) of the players being starred for those teams. As a consequence of this change, the subsequent sections of Rule 2 have been re-numbered. NB. In connection with the starring of players, club secretaries and team captains will doubtless remember that the OCA's official Guidance for Clubs and Captains (see the 'Admin Documents' page of this website) says that the main intention of the starring rules is "to ensure fairness in team selection" and that "The Association expects that team captains (in complying with League Rule 2.3) will normally 'star' the four strongest regular players in their squad unless there is good reason not to. Failure to star higher graded players who are known to be very likely to play regularly throughout the season (and then playing those unstarred players in lower teams) is one clear example of a way in which a club might seek to manipulate the rules unfairly." Please see the diary and grid formats for the 2018-19 fixtures. The heading should be in green so please remember to refresh your browser if needed. Any problems or issues please email me. Congratulations to Steve Rumsby from Banbury Chess Club, who was presented with his ECF President's Award for Services to Chess. 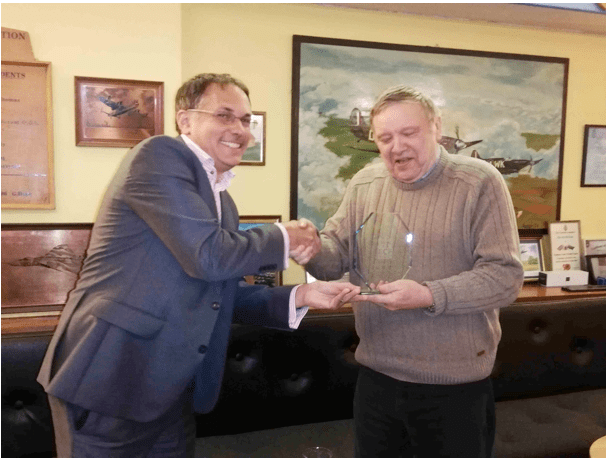 The Award recognises that for over 30 years Steve has been the Chairman of Banbury Chess Club. Steve has overseen the growth of the club from initially fielding two teams in one league to the latest season where the club fielded four teams in the Leamington League, three teams in the Oxford League and entered all the available league cup competitions. In recent years, Banbury entered a team in the 4NCL. Virtually every year, Steve has captained one of the club teams. Steve's wider contribution to chess is seen in his work for the Leamington and District Chess League. He is, and has been for a number of years, both the league's webmaster and fixtures secretary. At the start of the 2016-2017 season Oxfordshire County were unable to find a volunteer to captain the Under 150 county Team. Steve at short notice volunteered and led the county team to 5 wins from 6 matches. They ended that season as Chiltern League Champions. Steve has continued in this county captaincy role. Steve is highly regarded by chess players in an area stretching from Birmingham down to Didcot. Any unexpired news items dated before 1 August 2018 can be found by using the link for the relevant year. The link for 2017 will give news dated 01 Aug 2017 - 31 Jul 2018.